Frilled, gilled, clubbed, conical, round, and flat, savory mushrooms are where it’s at. We are mushroom fanatics. Possibly due to some ancestral mushroom-picking natural selection gained via a Polish heritage, but more likely because we enjoy umami over all other tastes. For those unfamiliar with the term, umami (pronounced oo-MAH-mee) is the fifth basic taste, best described as a rich, savory, brothy or meaty taste sensation. Foods with umami have very distinctive savory aroma and mouthfeel qualities that present a satisfying sense of complete, full-bodied flavor. Umami highlights sweetness and lessens bitter taste. Umami also counterbalances saltiness wonderfully, so it’s easy to reduce salt in a given recipe without compromising ﬂavor. Wild mushrooms are very, very generous in the umami department. Unfortunately, wild mushrooms can also be very, very pricey. As in, $14 per quarter pound pricey. Ouch. Many recipes call for only the mushroom cap or just part of the stem, cavalierly directing the cook to discard the rest. Ouch again. We don't know about you, but eking out every delicious drop of rich, savory flavor from the most precious ingredients seems a smarter use of hard-earned money. Those perfectly edible stem bits can easily add pizzazz to all sorts of dishes. 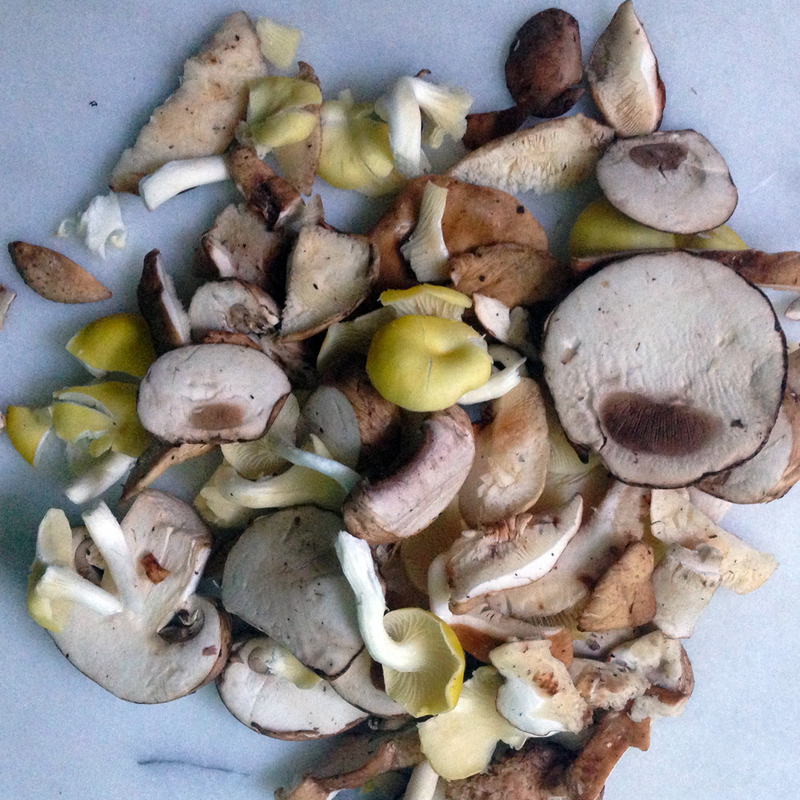 Mushroom stems work best when chopped to a small, uniform size. A food processor makes short work of chopping large quantities of stems. Add those chopped stems to soup bases, sauces, and stews. Or, use chopped leftover stems as a substitute for a similar savory ingredient. This stuffed mushroom appetizer, developed to accommodate a seafood allergy, swaps out crabmeat for mushroom stems and shallots. Although similar to Parmigiano Reggiano, Grana Padano cheese is less crumbly, milder and usually contains “cheese crystals”, which add an extra flavor pop. Feel free to use your favorite grating cheese instead. Preheat oven to 400°F. Prepare a baking dish by lightly oiling the bottom; set aside. Remove the stems from the mushrooms. Set caps aside. Trim off and discard any dark or hard spots on the stems, then finely chop. Set aside. In a medium saucepan over medium-high heat, melt the butter, then gently sauté the caps, gill side up, until golden, about 3 minutes. Transfer to prepared baking dish. Reduce heat to medium, add olive oil, and heat to just shimmering. Add shallots and sauté until softened, about 2 minutes. Stir in garlic, and sauté for 30 seconds. Add chopped stems and 1/2 teaspoon salt; sauté until most of the released liquid has evaporated, about 2 minutes. Add wine and reduce about a minute more. Remove mushroom mixture from heat, stir in breadcrumbs, rosemary, parsley, pepper, and salt to taste. Divide mixture among the reserved caps, drizzle a teaspoon stock over each, and bake fifteen minutes. Sprinkle with Grana Padano and serve hot. Leftover mushroom stems can also be frozen. Keep two containers in the freezer (one specifically for more woody stems) and add stems until you have enough for your recipe. Frozen mushroom stems are pretty soggy when thawed. Before chopping, wrap them in a coffee filter or piece of cheesecloth and wring over a small bowl, squeezing until dry. Save the juice and add that umami goodness to your recipe. Woody or hard stems are destined for stocks and broths. Shiitake stems make a particularly nice broth, but beech mushroom stems, the fibery parts of an enoki bunch, or tough portabella stems are all fair game. 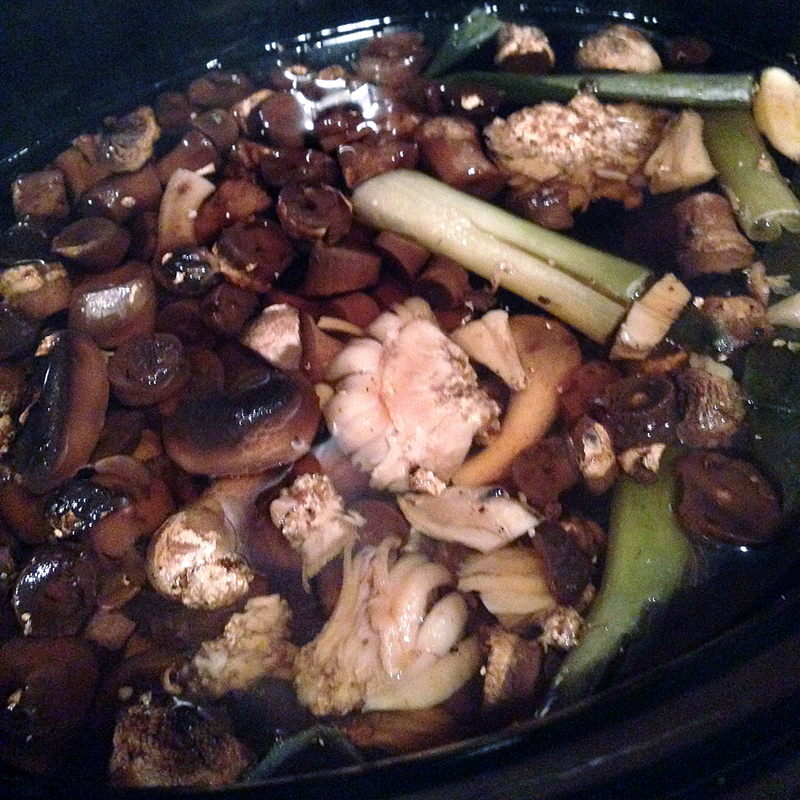 To intensify the mushroom flavor, the strained stock is reduced, uncovered. The combination of stems, aromatics, and water makes this a thin, fat-free broth. If more body is your fancy, first sauté any veggie ingredients in 2 tablespoons of butter, oil or fat of choice, then proceed as written. 1 large onion, sliced; 2 carrots and 1 celery rib cut into large chunks; 1 garlic clove, sliced; half-dozen parsley stems; teaspoon black peppercorns; dried herb of choice. 2-inch peeled ginger root, sliced into ¼” thick discs; 1 leek, sliced, 1 garlic clove, sliced; handful of cilantro stems; peppercorns or other herb of choice. Your personal favorite stock seasonings. Combine all ingredients in slow cooker. Cover and cook on low 6-8 hours. Strain, discarding solids. Transfer strained broth to a medium saucepan, and simmer uncovered over low heat until reduced to 8 cups, about 30 minutes. Season to taste with salt.